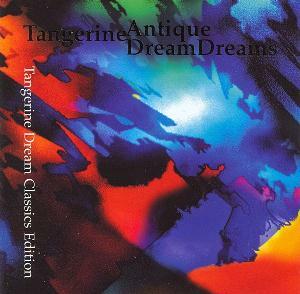 A true compilation of rare tracks by Tangerine Dream. Behind its mysterious title, are hidden 2 experimental cosmic tracks of the 70s' debut period and 10 electronic tracks of the Schmoelling period recorded in 1982. Antique Dreams starts with Oedipus Tyrannus Overture, a piece created for a theatre piece which is experimental ambient. The record goes on with Ultima Thule Part 1, a catchy pure psychedelic rock piece. The musical theme is very interesting, but it's a pity that the tune is too short, it could have last three times more. Then we jump directly to 80s' unknown tracks . The rest of the album is devoted to tracks which were live favorites of the during Tangerine Dream's Schmoelling period, but never realeased on an official album. While listening to Calymba Caly you will fly to space, and you will explore unknown planets with Folck of Bluebirds. The next track, Speed Dragon has echoes from Thief. The enchantment continues with magic tracks like Edinburgh Castle, the vaporous Moorland and an enjoyable mixture of the band's Sorcerer and Thief soundtracks. Southend Mall is an ok ambient song, which is catched up by the energic Cool Breeze of Brighton, a perfectly sequenced tracks maily composed by Franke. He will play this piece, also known as Vermillion Sands, during his live solo performances. The remix of Phaedra with 80s' sound is also surprisingly very interesting. It finishes with a surprising but enjoyable cover of House of the Rising Sun with synthetizers. The reason why I give it 4 stars instead of 5 is the first track which I am not fond of and whose presence is a little odd on this disk. By the way, Antique Dreams is a very good compilation of rare tracks from the electronic progressive pioneers and should appeal to all electronic music lovers and those who wants to go deeper into the band !